I am a huge fan of this sewing pattern, and have made several versions before (using scuba), which I have blogged about on previous posts. 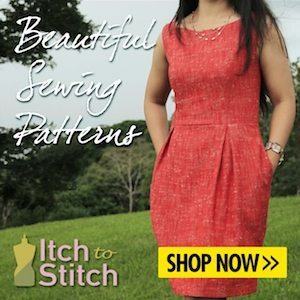 The reason that I am sharing another one with you, is that I am celebrating the launch of a new online knit fabrics boutique, Pin and Sew , by making up my favourite dress pattern using fabric from her brand new store. I was recently approached by Aga, who is the owner of Pin and Sew. She explained that she was launching her new venture soon, and wondered if I would be interested in taking a look at the website and perhaps trying out some of her fabric. Her website specializes in knit fabrics, and as I love sewing with knits, it was good to take look at what she has to offer – but not so easy to choose my favourite out of them all! Over on the Pin and Sew site, you will find a good selection of jerseys, French Terry, Ponte and Sweatshirt fabrics. Patterned and plain, there is something for everyone. I opted for this wonderful green French Terry which has a floral design (honeysuckle I think), and Cranes. It is also available in a blue colour way. I have never sewn with a French Terry before and was keen to try out this type of knit. It is rather like a sweatshirting fabric, with a small loop back on the wrong side, but more light weight. There is also a great selection of adults and children’s sewing patterns for sale too, all geared towards sewing with knits. The fabric arrived in next to no time, and I was delighted to see it arrive in plastic free wrapping. The strong brown paper bags used by Pin and Sew will still protect your fabric in transit, but are totally environmentally friendly. The fabric was also accompanied by an information card giving me care instructions for my fabric. Over on the Pin and Sew website, you can learn all about their concern for the environment and how this is reflected in their packaging. Back to the Pattydoo pattern. Another reason for writing about the Chloe Dress again is to mention that a pattern written in another language can still be made up with very little problems. Pattydoo is a German pattern company and has a large range of reasonably priced PDF patterns for adults and children, as well as some free patterns too. I recently made their free shopping bag (the Milly bag) and plan to blog about this shortly too. Firstly, this PDF pattern was 3 Euros. Can you believe it! I am still stunned by the low price of this. After printing out the pattern and instructions, I realised that I would need some help from Google Translate. This helped a little, especially with the fabric requirements and cutting instructions, but what really is the game changer for this company is that they have a YouTube channel where you can follow a complete video sew-along for the construction of the dress. Whilst this is still spoken in German (I don’t speak a word of German), the visual aspect of it is so good (along with seam allowance measurements being flashed up on the screen), that you barely need anything else – it is really excellent! I would still recommend that you make up a toile in this situation before cutting into precious fabric, just in case you have missed something important along the way! Another thing to bear in mind with the video guide is that she is showing you how to make the child’s dress, so if you are making an adult version, you just need to remember to sew in the bust darts at the appropriate time and also add some elastic to the centre back waistline to give it some shape there too. Guidance on these steps are found in the pattern’s written instructions. The pattern has a choice of sleeve lengths, and the neck can be finished with a neckline facing or you can add a neckband. I chose to make the short sleeved version, and as you can see I used a neckband to finish the neckline, as I love this finish. This cotton French Terry is wonderful to sew with, soft and breathable, and is a perfect weight for this dress. I am also imagining this fabric made up into a Grainline Studios Linden Sweatshirt – how dreamy.. Yes, this pattern has pockets. It doesn’t get any better. Although I feel I may have accidentally stretched out the pocket edges when I top stitched them, despite using a walking foot, so will take extra care with this step next time. It also pays to be extra careful to trim down your seam allowances where they are bulky to avoid any lumps which I have in a couple of places. I need to remember more haste and less speed. Aside from the walking foot if you have one, it is also a good idea to use ball point pins or wonder clips, and stretch/jersey or ball point needles on your machine when sewing knit fabrics. I always test on a scrap of leftover fabric before I start sewing on my main project just to check that I am happy with the stitch. Because I have made the dress so many times before, I knew the alterations that I needed to make, and already have the adjusted pattern pieces ready to use. I must be honest – I have lost weight since I made these measurements, so could probably do with adjusting them again, but basically I lengthened the bodice (unusually for me), by 2cm and added 3.5cm to the skirt length. I am super pleased with how the dress has turned out. 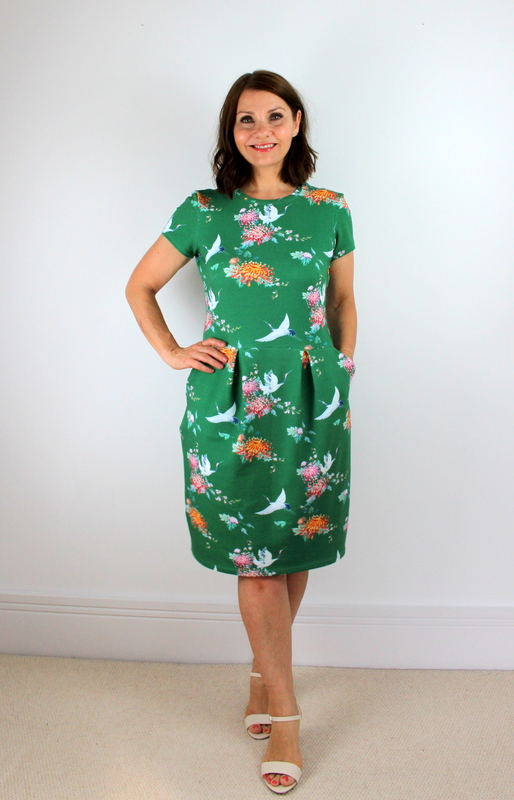 I am often on the look-out for green floral fabric and it’s not always that easy to find, so I was really chuffed to have had the opportunity to make this dress with this wonderful fabric. Thank you so very much to Aga, for giving me the opportunity to work with her during this exciting launch, and providing me with such pretty fabric. As well as the website linked above, you can also find Pin and Sew over on Instagram and facebook. I would love to hear if any of you have any more tips on sewing patterns that are printed in a different language to your own. Do share any of your tips in the comment section below.